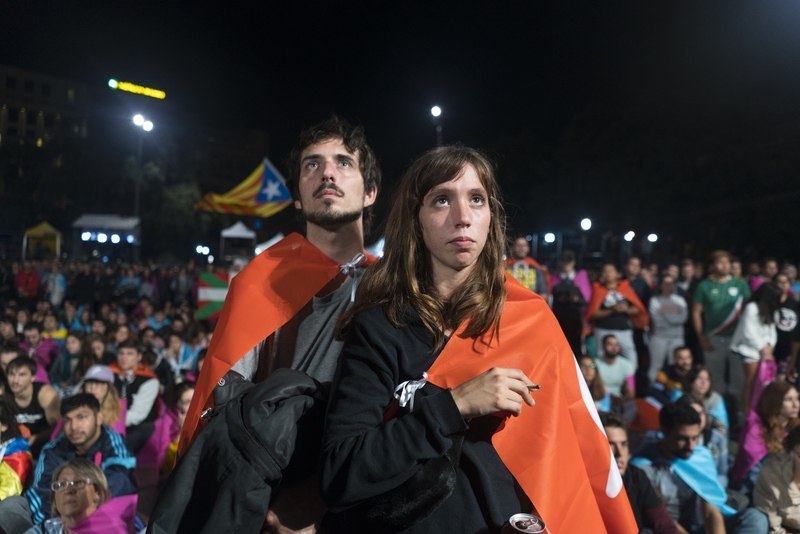 The following ongoing work chronicles the Catalan struggle for independence. Photographs with the (AP Photo/Daniel Cole) caption were shot on assignment for the Associated Press. Catalonia's national day, Sept. 11, 2017. 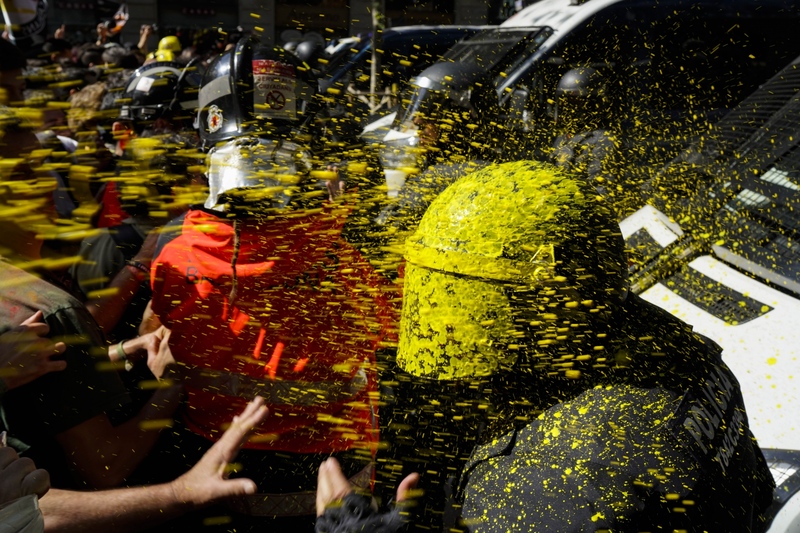 Pro independence demonstrators throw paint at Catalan police officers during clashes in Barcelona, Spain, on Saturday, Sept. 29, 2018. 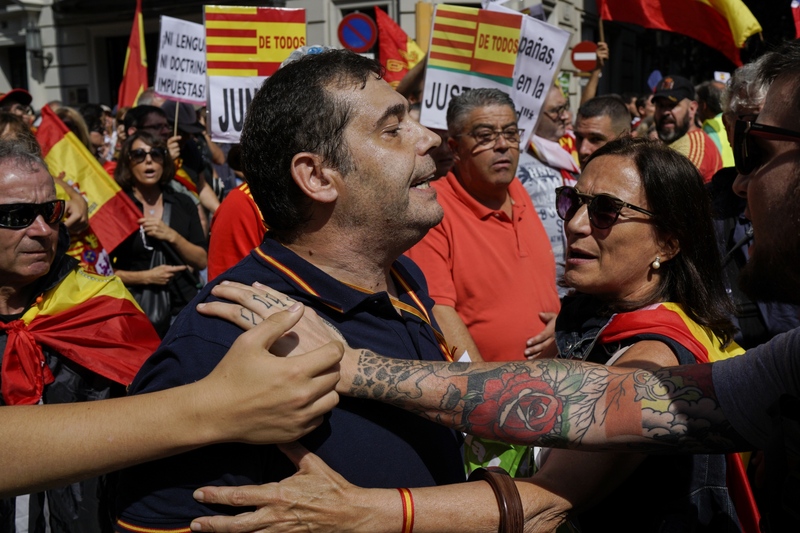 Catalan separatists clashed with police on Saturday in downtown Barcelona as tensions increase before the anniversary of the Spanish region's illegal referendum on secession that ended in violent raids by security forces. 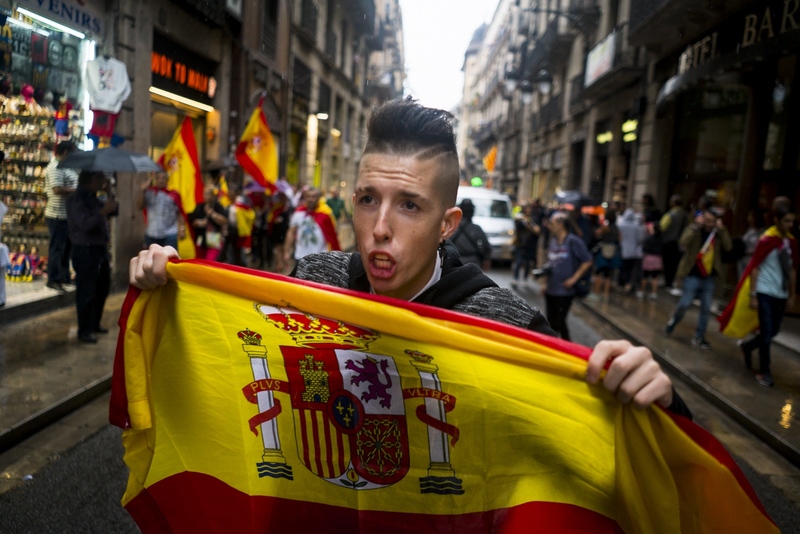 A demonstrator supporting Spanish unity shouts slogans towards Catalonian separatists during a demonstration in Barcelona, Spain, Sunday, Sept. 16, 2018. Police in Barcelona had to intervene on Sunday to keep apart a group of Catalan separatists and a march of those who support Spanish unity. 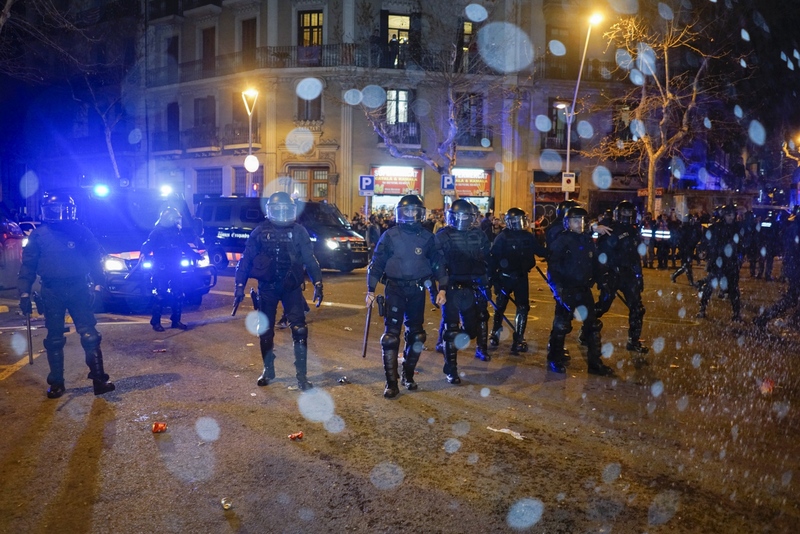 Police formed a barrier to keep the opposing groups from reaching one another when the separatists rallied in a downtown square where the march in favor of the increased teaching of Spanish in local schools had planned to finish. 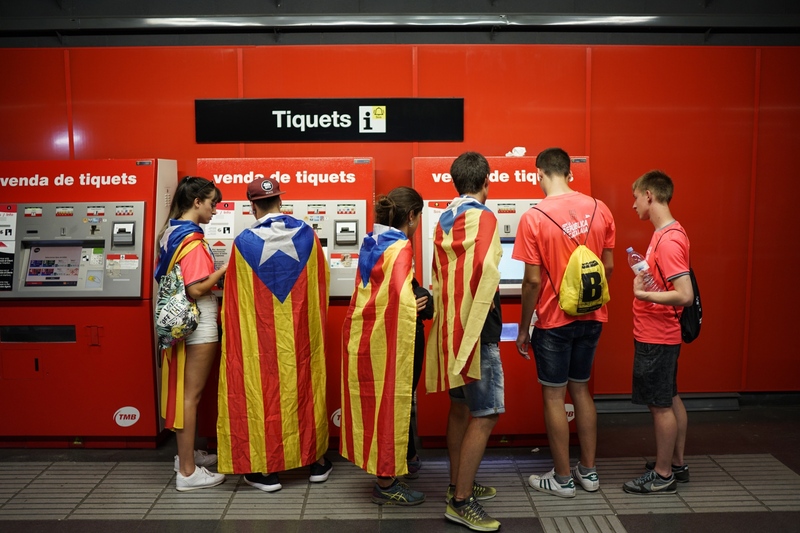 Youth carrying Catalan pro-independence flags on their shoulders get tickets for the subway on their way to a demonstration marking the Catalan National Day in Barcelona, Spain, Tuesday, Sept. 11, 2018. 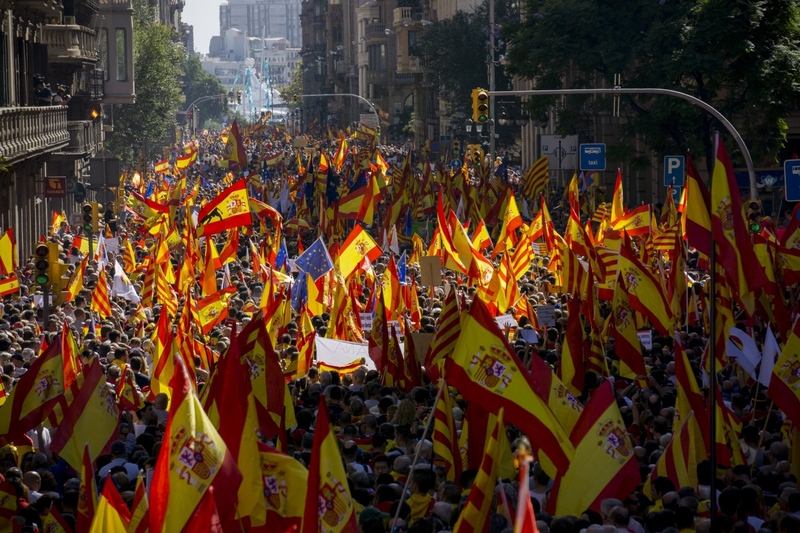 Catalan authorities have made a call to flood the streets of Barcelona later on Tuesday. 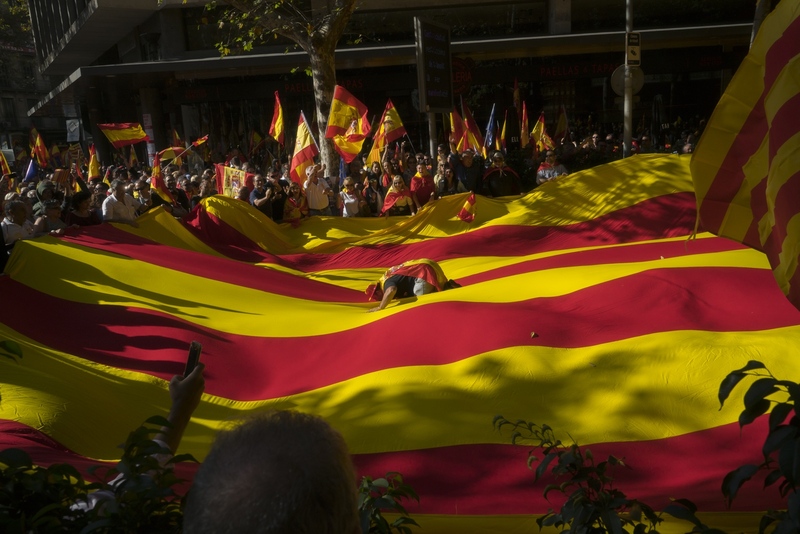 Sept. 11, called "Diada," marks the fall of the Catalan capital to Spanish forces in 1714. 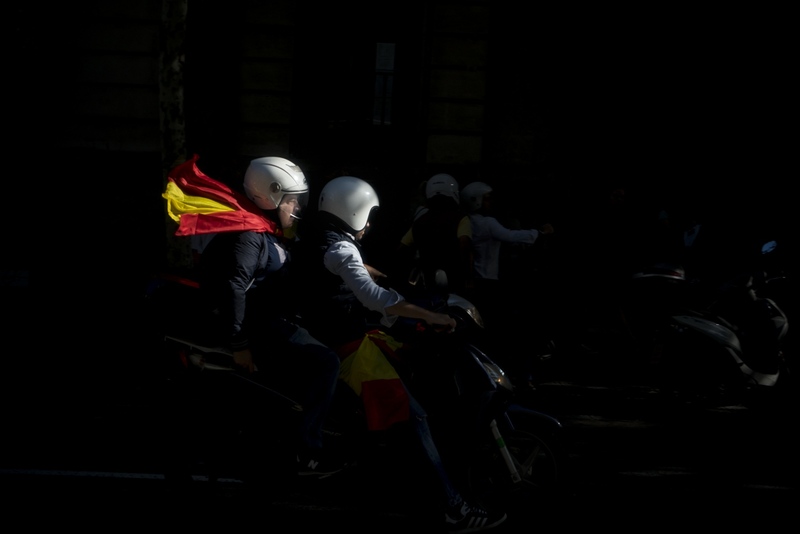 Demonstrators, some of them holding flares, march carrying "esteladas" or independence flags during the Catalan National Day in Barcelona, Spain, Tuesday, Sept. 11, 2018. 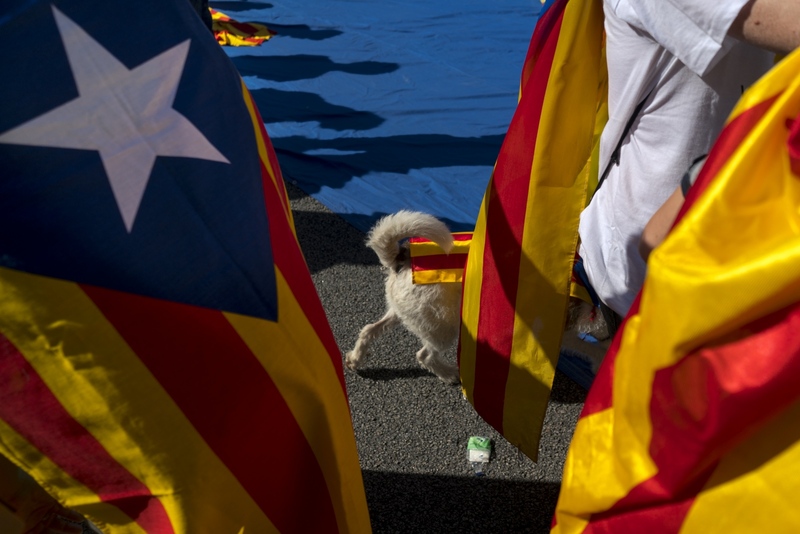 Catalan separatist authorities have made a call to flood the streets of Barcelona later on Tuesday in a march calling for independence from Spain. 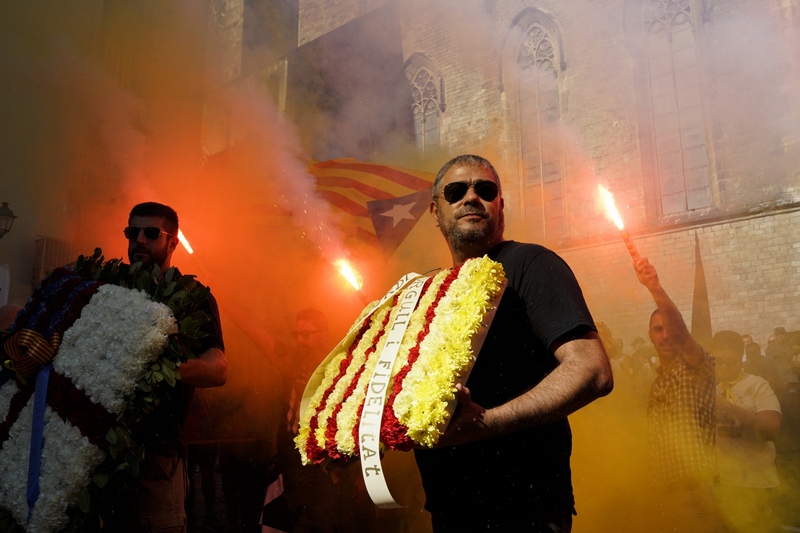 The traditional march on the Sept. 11 "Diada," which remembers the fall of the Catalan capital to Spanish forces in 1714, is expected to attract this year hundreds of thousands of secession sympathizers. Juame Balmes school, October 1st Catalan independence referendum. 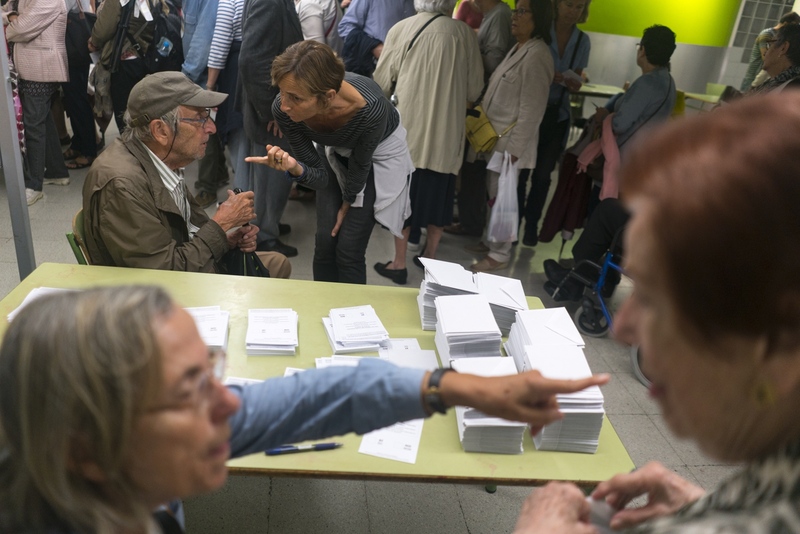 Voting papers at la Escola de la Concepció, Oct. 1, 2017. Having just met outside the voting center, Victor helped walk Magda through the crowd and to the voting tables. “I saw her outside struggling, and because I myself don’t have a grandmother to help, I said, today Magda will be my grandmother” Oct. 1, 2017. 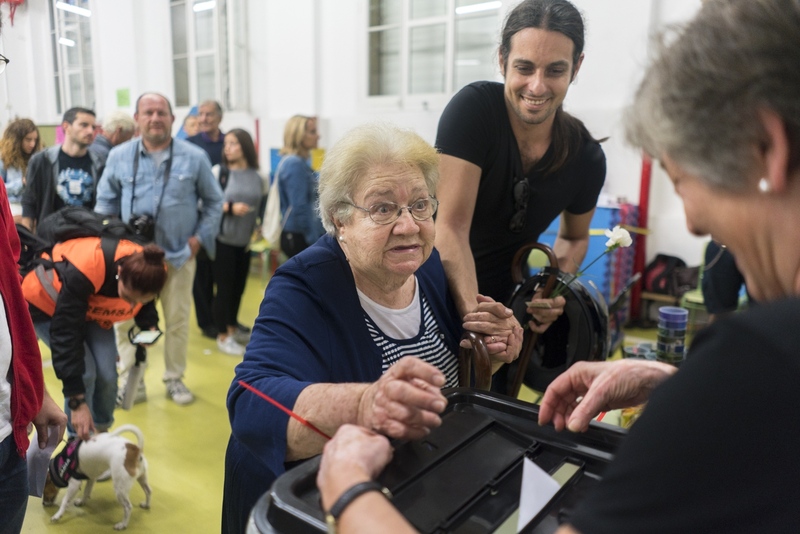 The night of the Catalan independence referendum, Oct. 1, 2017. Mossos d'Esquadra on the night of exiled Catalan president Puigdemont's arrest in Germany, March. 26, 2018. 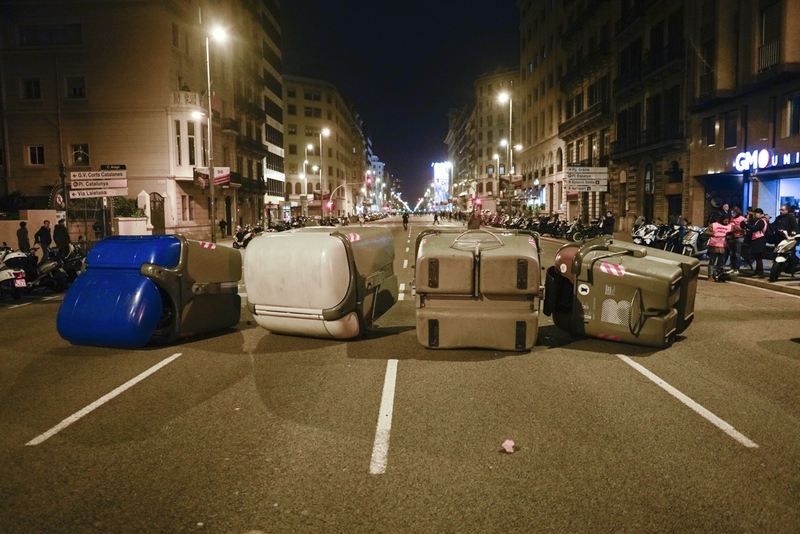 Calle Aragón on the night of Puigdemont's arrest in Germany. Barcelona, March. 26, 2018. 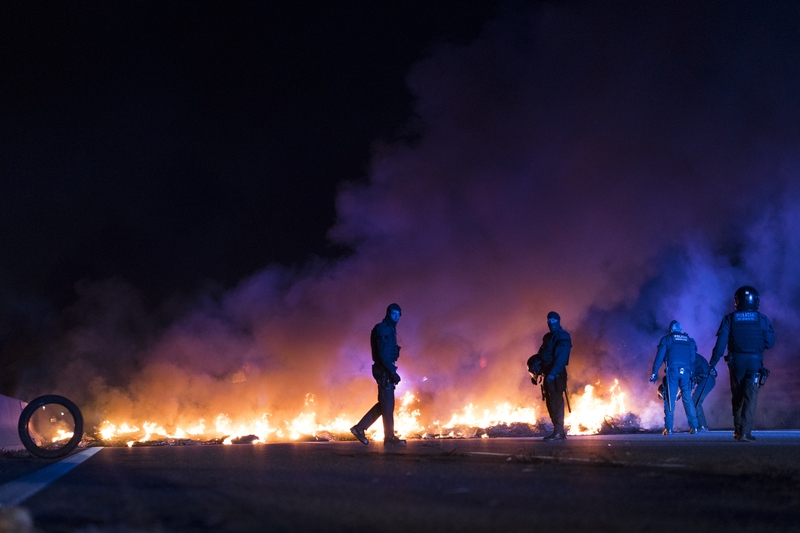 Police officers try to remove burning tires blocking a highway, set by demonstrators protesting the imprisonment of pro-independence political leaders, during a general strike in Catalonia, Spain, Thursday, Feb. 21, 2019. 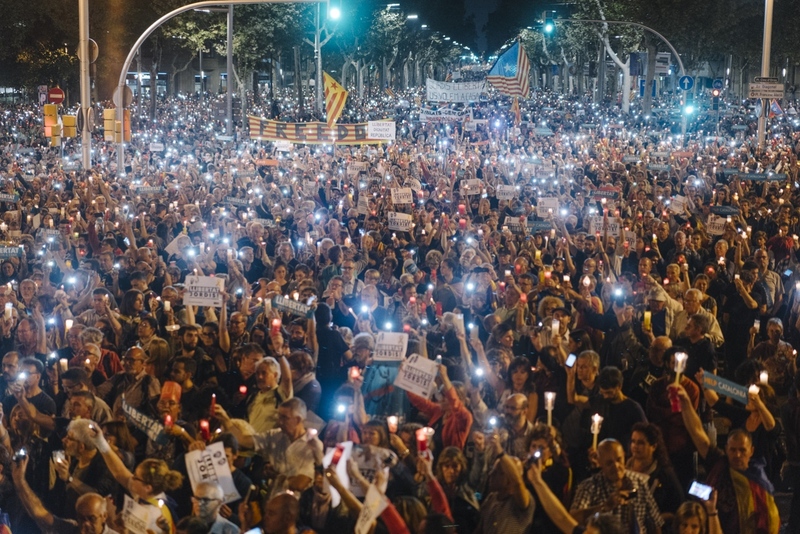 A crowd of over 200,000 people in Barcelona raise candles and phones during a five minute silence for Jordi&Jordi, the leaders of the largest civil societies in Catalonia who were imprisoned by a Spanish judge, Oct. 17, 2017. 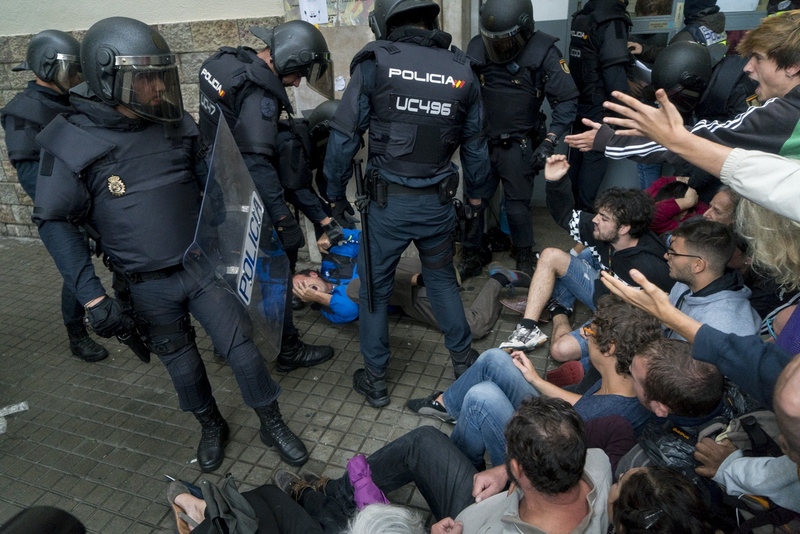 The leaders face charges of possible sedition for organizing protests on September 20th when the Spanish Guardia Civil arrested Catalan officials in various government offices in an attempt to foil the October 1st referendum. Hundreds of thousands of protesters fill Barcelona's Via Laietana, Oct. 8, 2017. 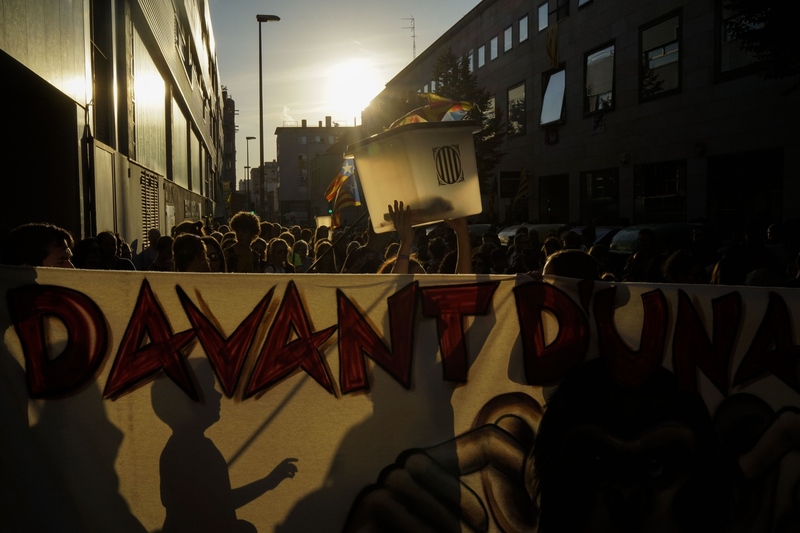 Organized by the Societat Civil Catalana, the march drew 350,000 atendees according to the Guardia Urbana and just under 1 million according to the organizers. 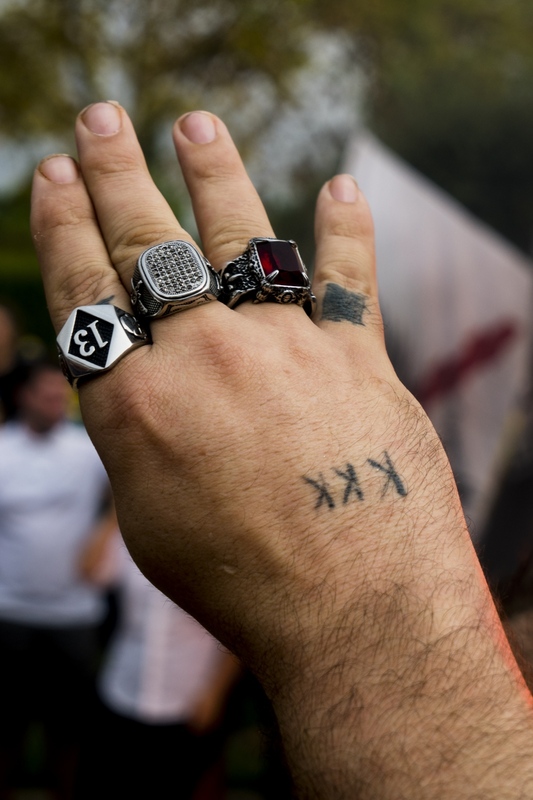 A Falange protest, Sept. 30, 2017. 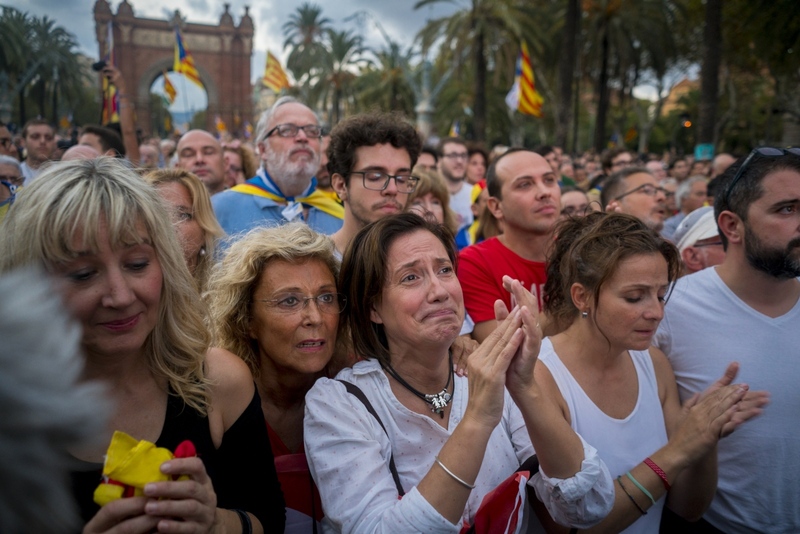 Muntsa Casas watches Catalan president Puigdemont's speech on a mega-screen in Barcelona on Oct. 10, 2017. After declaring independence the president suspended the declaration to pause for dialogue with Spain. 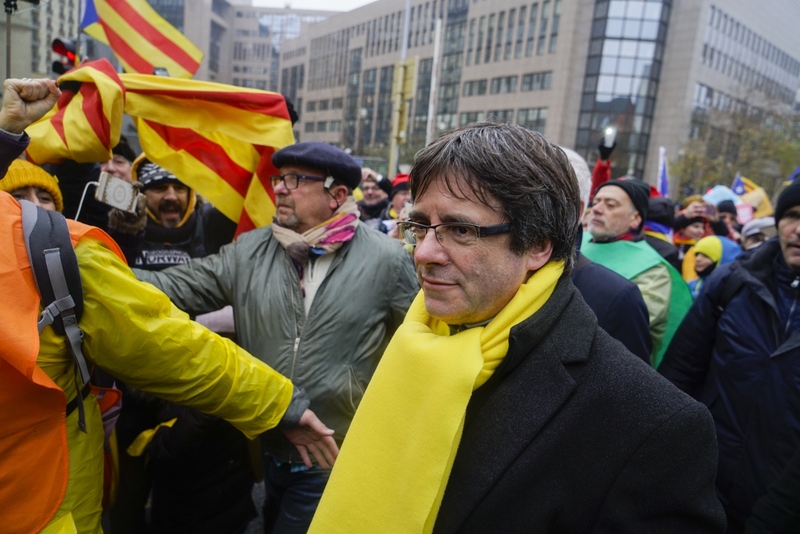 Exiled Catalan president Puigdemont in Brussels, Dec. 7, 2017. Puigdemonts in Barcelona, Jan. 30, 2018. 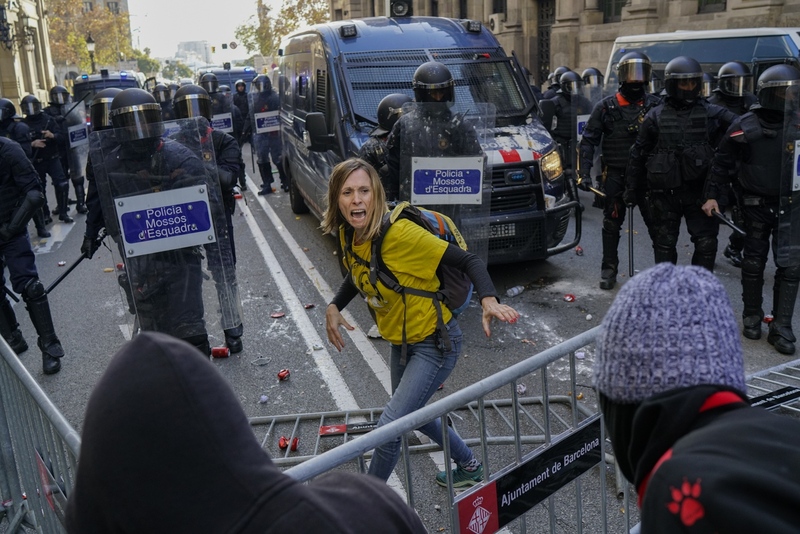 A peaceful protester tries to stop fellow protesters from breaching a police barrier and disrupting the Spanish Cabinet from holding a meeting in Barcelona, Dec. 21, 2018. A Falange protest the day of the Catalan independence referendum. Oct. 1, 2018. 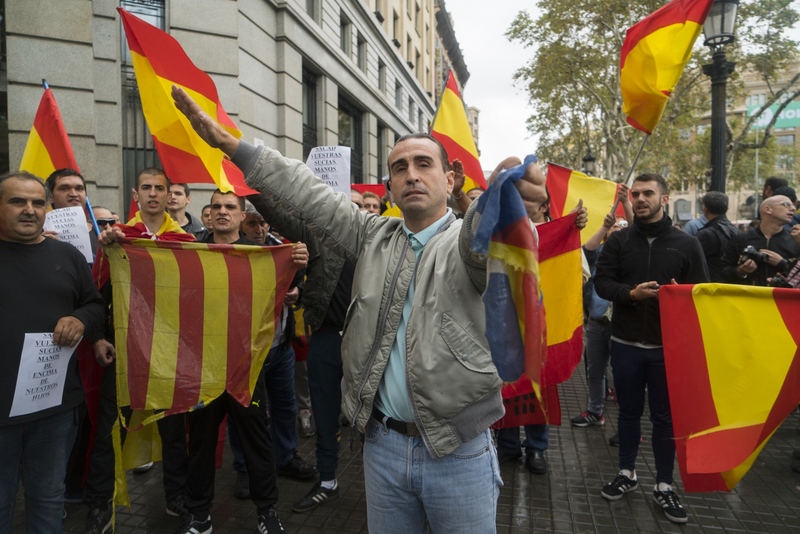 Members of the fascist political party La Falange perform a fascist salute during Spain's national day, Oct. 12, 2017. 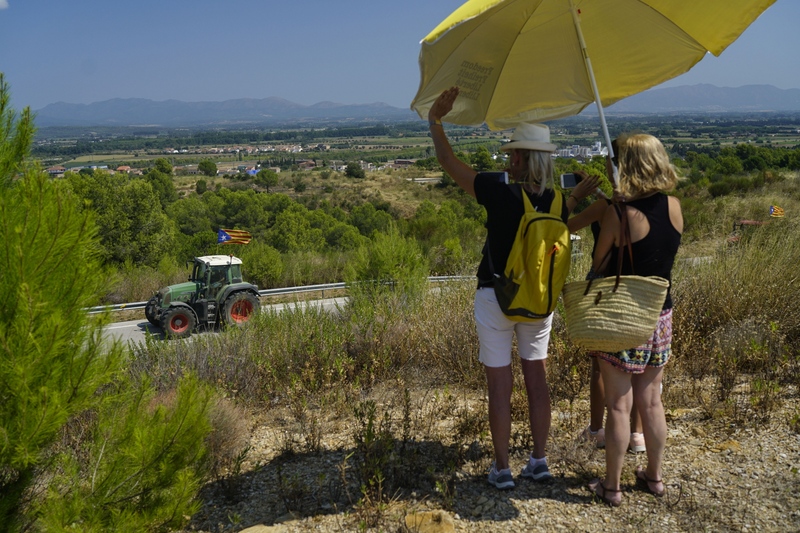 A tractor caravan organized by the Catalan Farmers Union arrives at the Puix de les Basses prison where ex-minister Dolors Bassa is held on charges of Rebellion against the Spanish state for her role in organizing the Catalan independence referendum, Aug. 22, 2018. Unionist protest in Barcelona, Oct. 8, 2017. 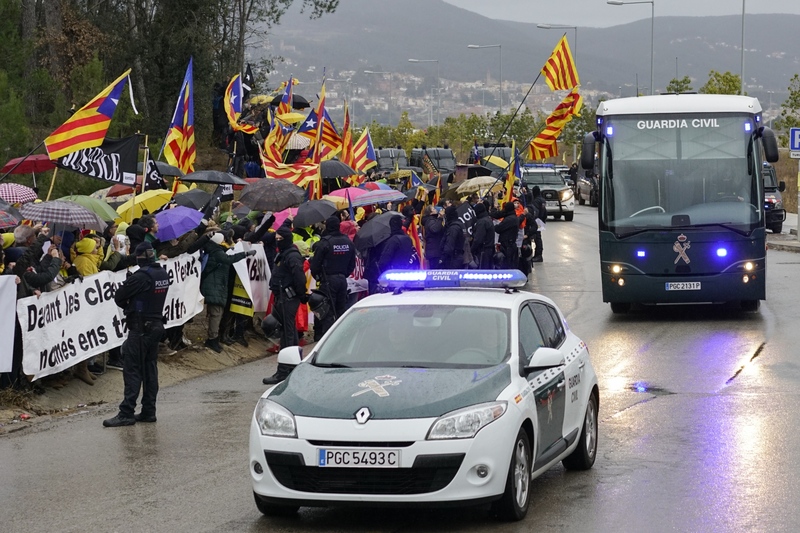 Demonstrators wave esteladas or independence flags as a bus of the Spain's Civil Guard carrying the nine Catalonian politicians and activists, leaves the Brians II prison, in Barcelona, Spain, Friday, Feb.1, 2019. 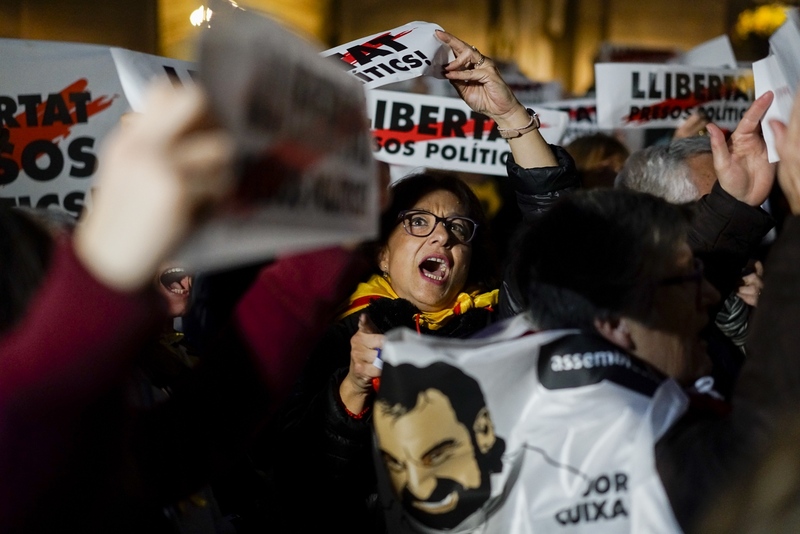 Spanish authorities transferred nine politicians and activists on Friday from prisons in Catalonia to the country's capital, Madrid, ahead of a high-stakes trial for their part in an attempt to secede from Spain. 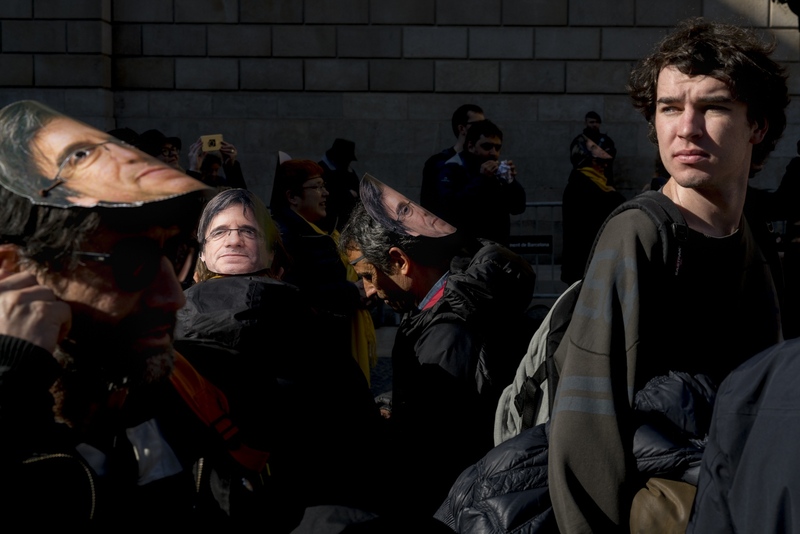 A protest in support of Catalan political prisoners, Feb. 16, 2018. Unionists in Barcelona, Oct. 8, 2017. A rally to commemorate the one year anniversary of October 1st in Sabadell, Oct. 1, 2018. Catalonia Crisis The following ongoing work chronicles the Catalan struggle for independence. Photographs with the (AP Photo/Daniel Cole) caption were shot on assignment for the Associated Press.